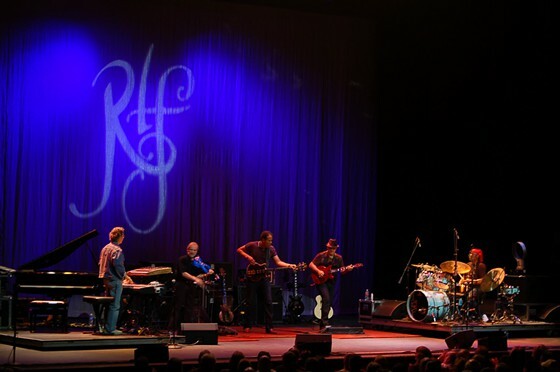 Stanley Clarke announced to an excited Midland Theater crowd that this latest version of Return to Forever wasn’t like all those other reunion bands who declare that a tour was their last time around. Rather, the bass player said, Return to Forever were just turning a new page. Keyboardist Chick Corea has reconvened his famous Return to Forever groups several times since the band’s 1970s heydays. The current incarnation –- dubbed Return to Forever IV -– comprises Corea, Clarke and drummer Lenny White with violinist Jean-Luc Ponty and Frank Gambale on guitar.Clarke’s comment may have seemed an odd way to describe a two-hour repertoire was at least 30, and sometimes nearly 40, years old, but while the tones and textures of the original recordings remained unchanged, it was obvious the musicians were having fun exploring this music in a new context. The quintet’s massive sound easily filled the big room. Playing at rock-show volume they opened with “Medieval Overture,” the first of three songs pulled from their classic “Romantic Warrior” album. White’s drums and Corea’s keys were pristine throughout the night, but it took a couple songs before Clarke and Ponty got the prominence in the mix they deserved.The telepathy Corea, Clarke and White have developed playing together over the decades were obvious from the first notes. While they were far from ringers, it seemed to take Ponty and Gambale a moment to insert their voices in the conversation, although the mix may have contributed to this as well. Once the sound and musicians adjusted the already-nimble music hit warp speed. Ponty had already soloed before sounding off of Corea’s piano during the snippet of “The Shadow of Lo” that prefaced “Sorceress,” but in that moment he established his presence. Ponty dominated the next number, a reading of his 1975 composition “Renaissance.” The first completely acoustic number of the night, it demonstrated the ensemble was still just as powerful in the quieter setting. On “Romantic Warrior,” the other unplugged number, Clarke essentially turned his upright into a massive drum by slapping the neck with alternating hands. Although everyone took impressive solos, Clarke and Ponty’s seemed to generate the most applause throughout the evening. The night ended with a celebratory romp through Clarke’s “School Days” with Clarke and Gambale standing shoulder-to-shoulder at the front of the stage strutting and strumming like rock stars. RTF Setlist: Medieval Overture; Captain Senor Mouse; The Shadow of Lo (excerpt) > Sorceress; Renaissance; After the Cosmic Rain; Romantic Warrior; Spain. Encore: School Days.